3. God had Moses make new tablets, and He wrote upon them the same thing as on the first tablets (Exodus 34:1-2, 4, 28-29). A former professor at Bethany Lutheran College, candidate for Minnesota governor, and long-time member of the Evangelical Lutheran Synod has publicly pointed out a strong anti-marriage bias in the health care legislation that’s been so much in the news lately. You can see the news article at [WorldNetDaily][wnd]. As we prepare to enter the season of Lent for 2010, there is much planning to do in our little parish. We are blessed in many ways, not least in having Vicar Gullixson and his family among us. Lord willing, that will continue at least until June. After their stay with us, we will have to readjust to a parish life without a vicar. In the meantime, we expect to celebrate the confirmation of some of our Jr. Members at both churches on Palm Sunday. We anticipate joint mid-week Lent services, beginning on Ash Wednesday (Feb. 17) at 6:30 PM, at Bethany, and then alternating weekly between the two churches until Palm Sunday. After Ash Wednesday, we’ll have a “Soup & Sandwich Supper” at 6:20, followed by a Lent service at 7. Candidates for confirmation will have a public examination in those services. In May, Bethany is planning to celebrate its 25th year with a special service. We hope that Pastor Frank Fiedler will be able to attend and preach. Well before that happens, Bethany’s narthex project should be finished, so that we can dedicate it to the glory of God, with thanksgiving for His merciful goodness. (At present, the only essential thing remaining is some fine-tuning of the new outer doors.) As the Summer season approaches, we can be thankful again that God provided the means to replace our air conditioner in 2009. 2010 is already a banner year for Concordia, since we have adopted a revised constitution that we can fully uphold in practice. It will be submitted to the synod this year for review. At our annual meeting, we elected office-holders with a one-year term, since our constitution calls for an election in every odd-numbered year. 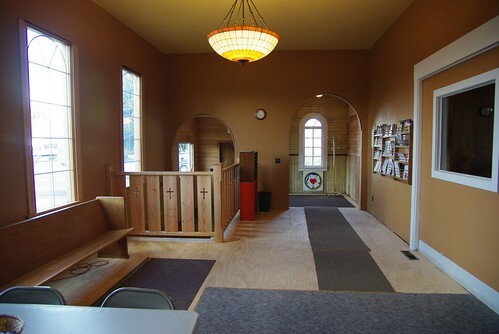 Also, the narthex renovations at Concordia seem nearly complete, with a beautiful, new, level floor and a fine, custom railing made from local materials. Our guests should already find a welcoming, pleasant atmosphere as they enter the building, and we hope to improve it further as we finish the project. Our maintenance budget this year will be reduced somewhat due to an emergency furnace expenditure, but we can be reasonably certain now that the new furnace blower will be reliable. As we continue our outreach Bible classes in Klickitat, it has become apparent that we should use a basic introduction to the Bible and to our faith. Meanwhile, our members who are more experienced students of the Bible would also benefit from a fresh approach to a more in-depth study of holy scripture. While I intend to continue using the *Gottesdienst* class as an overview of Christian teaching and worship, I have found a more comprehensive program for presenting the critically-important elements of Bible study. This program not only introduces the Bible to those less familiar, but provides the tools and skills needed for every disciple of Jesus to continue growing in God’s Word. The course covers many topics, from Bible interpretation through parts of the Old Testament, and also the New Testament. *Every* member of Bethany and Concordia would find it greatly beneficial, from about 10 years old and older. Our challenge will be to arrange it so that our members and guests will be less likely to miss any classes and fall behind. Your advice is welcome. At the moment, I am considering a schedule where three presentations of the same class session will be held weekly: one at Bethany, one at Concordia, and one at Klickitat. That way, if a student in one place has a schedule conflict, he can plan to attend the same class at one of the other places that week. As long as the church schedule allows it, I would present all classes in each unit, then take a month or two off before the next unit begins. I could begin teaching the first unit (10 lessons) in May. Again, your advice is welcome. Let us thank God for His many blessings upon us, and pray for His continued providence — especially the providing of His pure Word and Sacraments, wherein we find and receive the forgiveness of our Savior, Jesus Christ.